There’s a fake virus going viral (for real) on the web. It is a website that let’s you choose a screen that makes it look like your computer is broken or infected, so you supposedly can sigh to your co-workers and then leave and go home early. 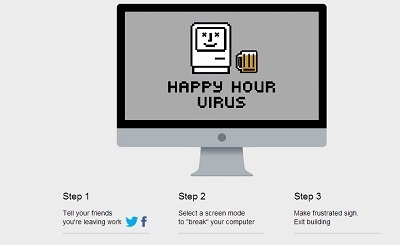 The website is called Happy Hour Virus. You have your choice of three different screens to fool your co-workers with: kernel panic, blue screen of death, and broken monitor (looks like broken video card to me). All it is is a webpage that emulates a problem on your computer. You can make it full screen so it looks authentic. Hit Esc to get out of it. This is funny, but I doubt if it would work. If you have an IT department at your work, and the word gets around your computer is broken, they would then come to fix your computer and would find out in about three seconds that you are faking it. You might be in trouble with your boss. If you don’t have an IT department and your boss hired an onsite IT support person to come in to fix it at one hundred dollars an hour, you’d definitely be in very hot water. So I don’t recommend it, but it is funny, and might be a funny prank to pull on someone, if you don’t let it go on too long and raise the IT department or onsite support company. I may try it on my computer techs…they won’t fall for it more than a second or two. Still it might perk up a Tuesday morning. If you need onsite it support for your business or home. Don’t hesitate to call Ducktoes.